2018-08-03 Woodo MB series gets a big brother! 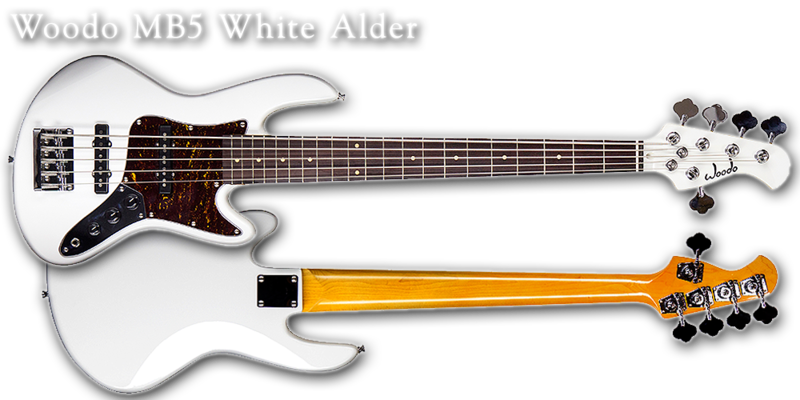 The 5-str Woodo MB5 White Alder combines best features of tradional and modern design! 2017-01-23 Djent week with featured discount on Woodo GS3 Black Alder 8-Str Deluxe!!! 2016-12-10 Woodo B10 Ebony Single Cut. A 10-Str extended range bass for the extreme bass player! 2016-08-04 New Woodo GS3 Black Alder 6-Str! Fast. Light, Resonant! Absolutely Superior!!! 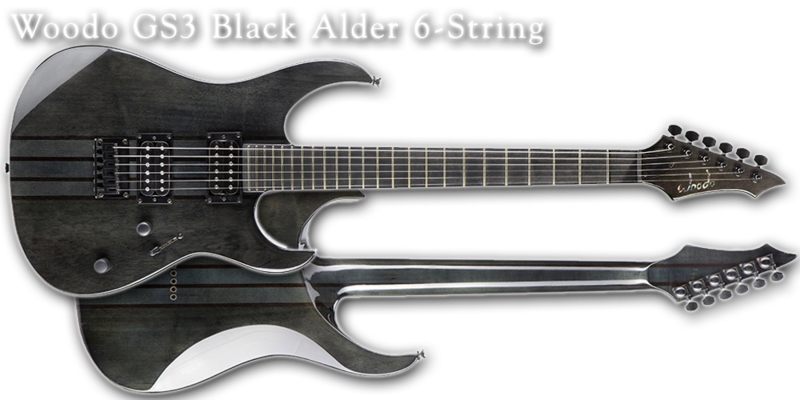 2016-02-26 New video : Woodo X6 Black Ash Deluxe with Lundgren Custom X6 pickups! 2015-09-30 New Woodo GS3 Black Alder 8-Str Deluxe with Seymour Duncan Nazgul & Sentient 8 pickups! 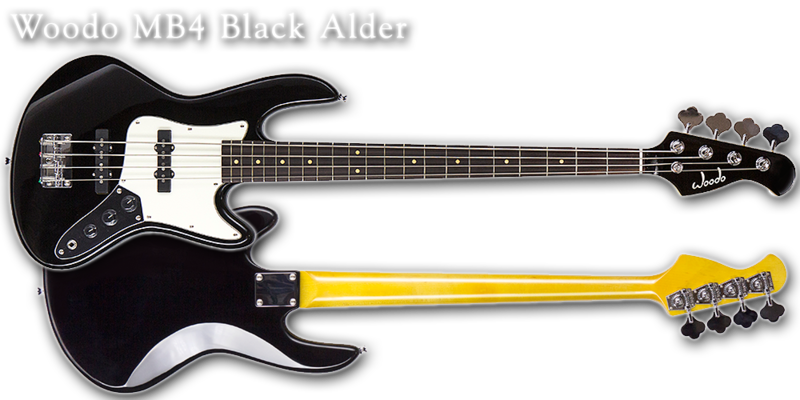 2015-06-06 New Woodo X6 Black Ash Deluxe med Lundgren Custom Single Coil Pickups!!! 2015-05-28 New 8-Sring Woodo Guitar : Woodo GS3 Black Alder 8-Str Standard!!! 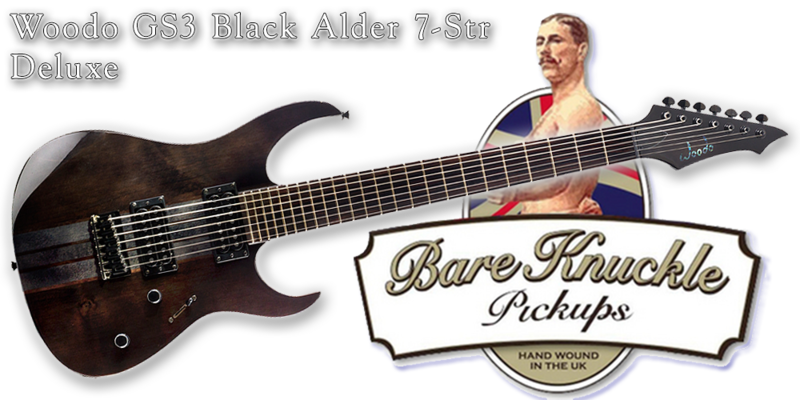 2014-08-29 New 7-str Woodo gutiar : Woodo GS3 Black Alder 7-Str Deluxe with Bare Knuckle Juggernaut pickups! 2014-08-29 New 7-str Woodo gutiar : Woodo GS3 Black Alder 7-Str! 2014-08-25 New Woodo X series. Check out now!!! 2013-12-18 New endorser!!! Kristoffer Folin. 2014-12-17 D'Addario Strings available now in the Woodo Shop! 2013-09-29 New endorser : Marcus Wesslen from Dead by April! 2013-09-27 Woodo Guitars at the Musician's Planet Fair - Stockholm. Be there!!! 2013-09-07 Woodo Guitars lauches the new web site. Roam free! 2013-02-14 Happy Valentine! Give yourself a Woodo bass whole heartedly. Choose one of the new basses from the Ebony product line! 2013-02-13 New model! 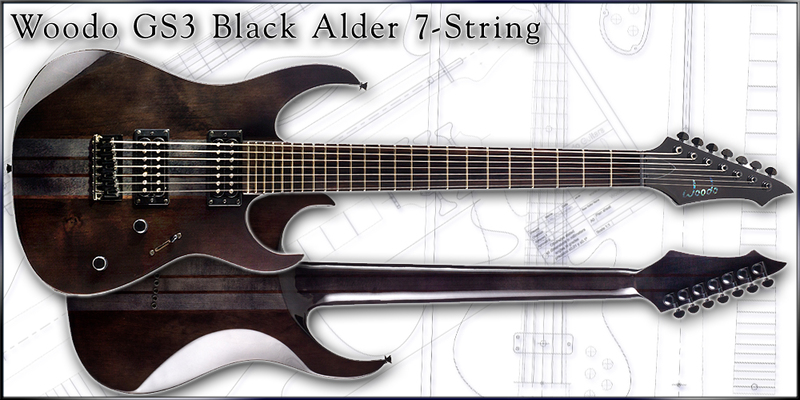 Woodo GS2 Ebony 7-String Deluxe with 27" scale and Lundgren M7 pickup. 2013-02-11 New Endorser : Andreas Wistrand. 2013-01-31 New shipment is here with previously sold out basses ie. fretless basses and 6-string basses! Check out the Web Shop! 2013-01-29 Woodo GSS Spalted Maple back in stock!!! A limited patch is now available through our web shop. Grab yours now! 2012-09-17 New Woodo bass : Woodo B5X Red Burl!!! 2012-09-14 World renown producer Krish Sharma (Rolling Stones, Ugly kid Joe, Counting Crows, Ziggy Marley etc) have acquainted himself with Woodo Guitars through producing the Swedish band "We Met Tomorrow"! Take a look at the reportage from the recording session : "Världsproducent i Kristianopel". 2012-09-01 New Woodo guitar!!! Woodo GTH1 Ebony with P90 and Humbucker pickups! 2012-09-01 Woodo Guitars will be exibiting in Musician's Planet fair in Stockholm October 20-21st. Be there!!! 2012-08-29 New Woodo bass!!! Woodo PJ4 Ebony with PJ pickup layout for maximum versatility and tone. Get your PJ4 now!!! 2012-05-08 Sebastian Näsström from Kristinehamn is travelling to Hollywood to stand on the BIG stage! And of course with his Woodo B4 Walnut. He's chosen to be one of 1200 artists to show his measure in he "World Championship of Performing Arts" competition. Watch the TV4 Play reportage (in Swedish) about his adventure to be here : "Hollywood nästa för Sebastian"
2012-05-06 Woodo Day in Musikverkstan Gothenburg May 12th!!! Thomas Fanto and Eric Wakenius are going to make a demo Jam with Woodo instruments in Musikverkstan Gothenburg the 12th of May between 12-16. Woodo Special Discounts available!!!! Be There! 2012-03-20 NEW ENDORSER!!! Are With Gogstad : The Southern Cross, Paul Di'Anno and Ripper Owens Are says : "My Woodo B4 Poplar Birds Eye has wonderful punch and strenght, which is required for playing (heavy) rock music. It has an easy playing neck and holds its tune well. What strikes me is the bass' versatility. It has tone qualities which makes it sound good playing different styles of music. And, of course, it looks great!". 2012-02-25 New model!!! Woodo GS1 Sycamore with fixed Bridge. EMG HZ Pickups and Grover tuners. Check it out! 2012-02-15 The new Shipment of instruments is here. Updated stock. Check out if your Woodo has arrived! 2011-12-11 New sound clips. Now embedded in the product pages as a Flash player. 2011-09-09 Woodo Guitars will be exhibiting in the Musician's Planet 1-2nd October. Be there!!! 2011-05-01 Super Deal!!! Buy your Woodo GTC to an incredible price 3950 kr through our Webshop. 2011-04-30 Woodo Guitars will exhibit in FUZZ Guitar Show 21-22nd May in Gothenburg. Welcome! 2011-03-32 New bass model!!! Woodo B5X Maple Burl. Wood selections with sonic perfection! 2010-12-03 The long awaited shipment is here! Order your Woodo now and get it in time for Christmas! 2010-06-08 Introducing a new Woodo!!! Woodo JB4 Ebony. Coming september. Pre-order now for just 5950 kr (normal price 6950 kr). Pre-order discount valid thru 2010-06-25. Private customers only. Pre-order Now!!! 2010-04-22 New Endorser : SURVIVING THE CHARADE! 2010-04-18 New Endorser : Thomas Fanto. His choice is Woodo SA5 Simon Andersson Signature with Glockenklang preamp. 2010-04-03 New video clip! Dino from Carnal Forge reviews Woodo GTC1 Ebony. 2010-03-30 The long awaited shipment is here!!! And the previously sold-out instruments are back in stock. Get your Woodo now!!! 2010-01-13 New sound clips : Woodo SA5 Simon Andersson Signature, Woodo B4 Black Walnut and Woodo GS2 Ebony 7-String. 2009-12-20 New Woodo endorsers: Richard Sundström - Vindra, Timmy Leng - Despite, Patrik Strömberg - Violated. Check out in the "ARTISTS" section! 2009 11-19 Woodo SA5 Simon Andersson Signature Series ready to ship! Now with Glockenklang onboard preamp! 2009-11-17 New Woodo products!!! Woodo B4 Black Walnut, Woodo B5 Black Walnut, Woodo B7 Black Walnut and Woodo B5 Bubinga Burl. 2009-10-29 Now they are here!!! The new delivery from the factory. Make sure you get your Woodo now!!! 2009-09-03 GLOCKENKLANG gear now in Sweden! Take a test ride now! 2009-08-05 New endorser : Mahan Ahmadi - Havok. 2009-05-23 New endorser : Hobbe Housmand - Celestial Decay. 2009-04-15 Justin Biggs from Revolution Renaissance and Simon Andersson will visit the Woodo booth at Fuzz. 2009-03-30 Woodo Guitars participates Fuzz Guitar Show in Gothenburg April 18th-19th as an exhibitor. Please come and visit us! 2009-03-24 Now you can visit a new Woodo Shop in Heleneborgsgatan 19 Hornstull, Stockholm in order to test and purchase Woodo instruments. Please call or email prior to visit. We don't have regular open hours. Welcome! 2009-03-13 The new deliverance is here!!! Order your own Woodo now! 2009-02-05 New Video Clips in Youtube of Woodo GS2 Ebony: Woodo Videos. New Videos!!! 2009-01-22 New endorsers : Artists. 2008-12-15 New Woodo retailer in Växjö Sweden : Helges Håla. 2008-12-11 New Video Clips in Youtube : Woodo Videos. New Videos!! !